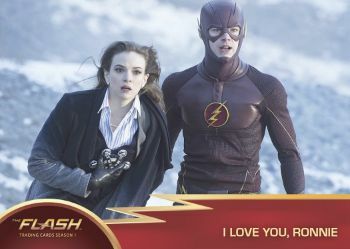 Covering the popular CW series dedicated to Barry Allen and his speedy alter ego, 2016 Cryptozoic The Flash Season 1 features a detailed look at the Arrow spinoff with a comprehensive set for the first season. Hobby boxes include one autograph and wardrobe relic. 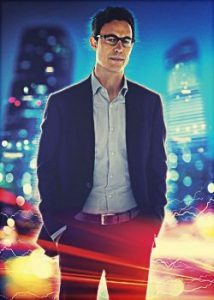 Based around Grant Gustin as Flash, the forensic investigator who gains his powers after a lightning strike, The Flash made its debut in 2014 and has built a sizable following as it pushes into additional seasons. 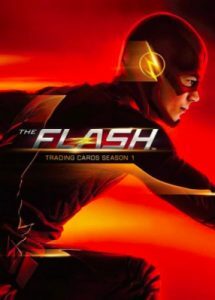 2016 Cryptozoic The Flash Season 1 follows the typical Cryptozoic format with 72 cards in the base set and several chase inserts. This includes Character Bios (1:4 packs), Locations (1:3 packs) and Rogues (1:3 packs). Parallels include Foil and Printing Plates. 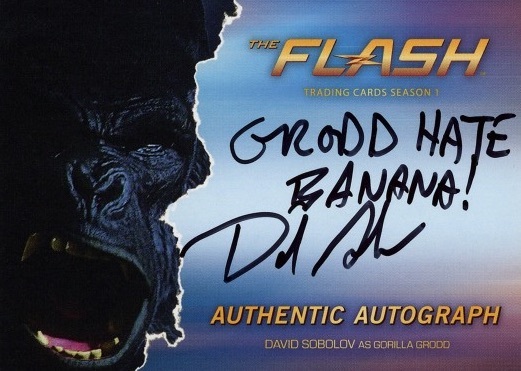 Autographs (1:24 packs) for key characters add another main component with many variants that showcase either the masked individual or the civilian for various subjects. It is important to note that characters that crossed over from Arrow cannot be included in the group of signers. 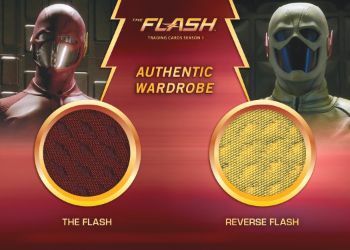 Also on the premium side of things, Authentic Wardrobe Cards come as either Single or Dual versions and contain swatches of show-worn items from several of the main subjects. Cryptozoic teased out a few of the still-intact items and a gallery can be seen below. This includes the "Keep Calm and Han Shot First" t-shirt worn by Cisco Ramon in episode 11 of the first season ("The Sound and the Fury"). Authentic Prop Relics are another option. 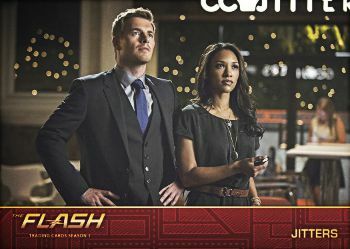 Found separately, a custom 3" binder offers a home for 2016 Cryptozoic Flash Season 1 and also includes an exclusive Wardrobe card. 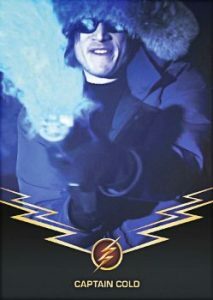 *Overall Odds (Base, Character Bios, Rogues, Locations): Rainbow Raider Foil Board - 1:3 packs; Golden Glider Foil Stamp - 1:12 packs, Printing Plates - 1:199 packs. PARALLEL CARDS: Rainbow Raider Foil Board - 1:3*, Golden Glider Foil Stamp - 1:12*, Printing Plates - 1:199*. 09 I’m A Detective, Remember? 19 Who Could Have Done This? 35 cards. 1:24 packs. Some cards have inscriptions. 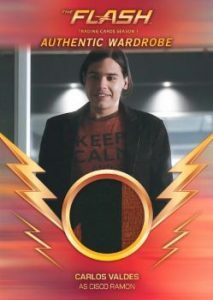 Any ideas why Grant Gustin, Candice Patton, and Carlos Valdes are missing from the autograph checklist? 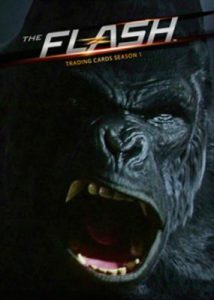 THE FLASH SEASON 1 TRADING CARDS HOBBY SEALED BOX CRYPTOZOIC - IN STOCK!